Tired of hand-washing your dishes but too short on space in your kitchen for a full-sized dishwasher? Give your hands a break and check out the SPT Countertop Dishwasher – one of the most popular, practical, and reasonably priced portable dishwashing units out there. Entirely and completely over washing dishes and already decided you need to have the SPT dishwasher in your life right now? We strongly recommend clicking here to check out the official Amazon page for the rock-bottom lowest prices. 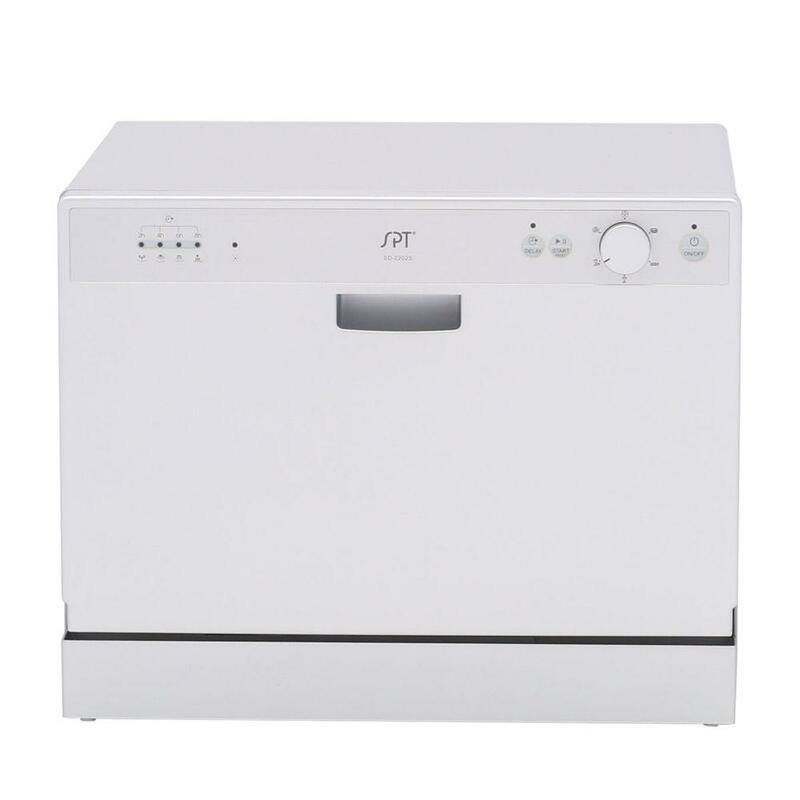 Calling all city slickers, tiny home owners, and super organized people: if you are completely sick and tired of hand washing dishes, need that extra oomph of help, or simply just want an efficient size-friendly appliance, then the SPT countertop dishwasher is for you! This SPT portable dishwasher, measuring approximately 21.6 x 19.7 x 17.2 inches (get your handy measuring tape ready to make sure it will fit your available area), is perfect for utilizing any small space you have in your kitchen. On their official website, SPT says this little number will fit between most countertops and cabinets. This gadget features some really awesome features that are definitely worth looking into. SPT Countertop Dishwasher: Why Buy It? 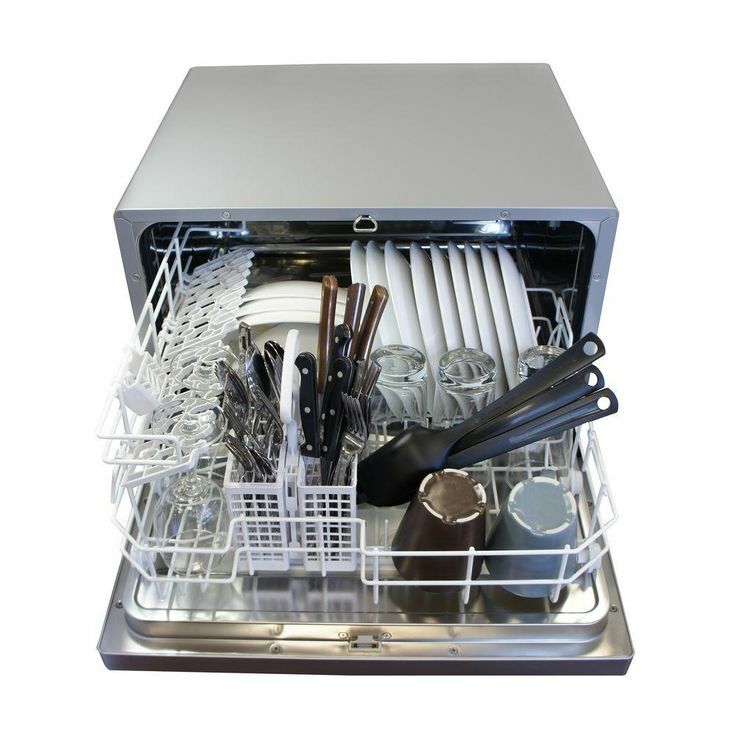 The SPT countertop dishwasher comes with durable stainless steel interior (and you will have the choices of white or silver for the outside), 6 cycles of wash (heavy, normal, light, glass, speed, and soak), dish rack, silverware basket, you’ll want to sit down for this – an automatic detergent and rinse agent dispenser, and – but wait, there’s more! – an adapter so you can hook this SPT dishwasher up to your kitchen faucet. Say what? Yes, you don’t have to go through the trouble of jumping through hoops to hook up your little dishwasher to get the maximum benefits of a regular united. However, the only catch with this one is your faucet should have a removable Aerator so you can set up the faucet adaptor (the size connections are Male 15/16″, Female 55/64″). I think the best thing about the SPT countertop dishwasher is that it isn’t loud. I have a regular sized dishwasher at my house in my kitchen which is in the same area as our downstairs television. Every time someone runs the dishwasher, I have to turn the volume up on the program I’m watching which then irks my partner or whomever is sitting next to me (insert face palm emoji here). This SPT dishwasher ends that vicious cycle! Compared to your everyday, regular sized dishwasher, the SPT countertop dishwasher will save you big money. According to the Energy Guide provided, the estimated yearly operating cost is around $24 when used with an electric water heater and $16 yearly when used with natural gas water heater. Of course this all depends on how often you use it but the savings are there especially if you live in city, can only afford a small space, or can’t really afford a full sized dishwasher. Now that I think about it, I could have totally used a SPT portable dishwasher my first year while I was away at college! Let’s be honest, no one likes washing dishes. Seriously, when is someone going to finally invent those food pills like in Willy Wonka and the Chocolate Factory where you get a full course meal no dishes included? And without turning into a giant blueberry and being rolled out by Oompa Loompas… anyway, I digress. My point is, if you need a product that’s going to help you out with your dishes as much as possible without going full-scale dishwasher, then this is for you! Your spouse will you thank, your hands will thank you, and you’ll be giving yourself a pat on the back as well – only thanks to the SPT countertop dishwasher, you won’t be patting yourself with dishwater-soaked hands.